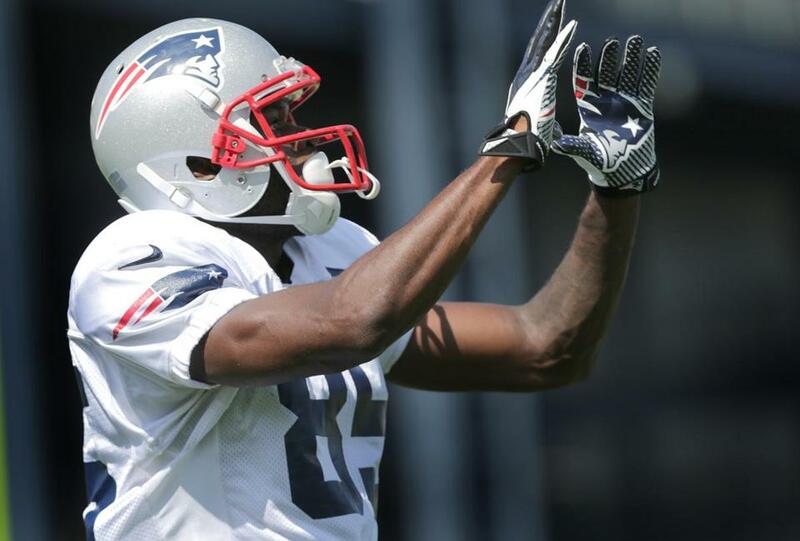 Kenbrell Thompkins has speed and has looked great in Patriots camp. 1. The wide receiver competition is clearly the No. 1 battle to watch as Tom Brady searches for his new favorite targets. This seems like an “all hands on deck” year when the Patriots keep six receivers, plus a couple more on the practice squad. Who knows if the rookies can handle the rigors of a 16-game season, plus playoffs? Danny Amendola, Julian Edelman, and rookies Aaron Dobson and Josh Boyce are roster locks. Undrafted rookie Kenbrell Thompkins, who might have the best speed on the field and has looked fantastic so far, is a clear favorite for the fifth spot. That leaves seven receivers, headlined by Matthew Slater, Kamar Aiken, and Michael Jenkins, battling for the sixth spot. Working against Aiken — he still has a year of practice squad eligibility. Slater is obviously more of a special teams and utility player, and behind Aiken as a true receiver. But the Patriots are going to need a “glue” guy like Slater in the locker room this season if and when more distractions — Aaron Hernandez or otherwise — pop up, and Aiken can possibly be stashed on the practice squad if he isn’t poached by another team. Thompkins also can go on the practice squad, but it’s doubtful the Patriots could sneak him through waivers. Training camp has extra importance for teams that changed coordinators. Here are five top NFC assistants in new places facing hefty expectations. Jenkins, a 10-year veteran, shouldn’t be feeling too comfortable, but working in his favor is a cap charge of $555,000. The Patriots, though, have been getting rid of their “progress-stopper” veterans one by one — first Donald Jones, then Lavelle Hawkins — and Jenkins hasn’t shown much in camp that he deserves to be kept over one of the promising youngsters. Amendola, meanwhile, is a marvel to watch in practice — his technique and precise route-running are impeccable — and he can very much replicate Wes Welker if he can stay healthy. 2. The tight end battle is a close second in terms of importance as the Patriots look to fill the void created by Hernandez and Rob Gronkowski, who could miss anywhere from zero to six games. The Patriots will likely keep at least three tight ends until Gronkowski returns, and possibly four. Don’t expect a ton of production from this group, as the Patriots likely trend more toward three-receiver, one-tight end sets until Gronkowski returns. But there’s talent, especially with undrafted rookie Zach Sudfeld, who may be the best all-around member on the field right now. He’s a tall red-zone target (6 feet 7 inches), the most fluid athlete on the field, and was graded as the best blocking tight end in this year’s draft. His injury history at Nevada scared teams, but if he stays healthy he’s got a roster spot locked up. Daniel Fells appears to be the No. 1 guy right now, with Michael Hoomanawanui taking on more of an H-back role (expect him to battle with fullback James Develin for a roster spot). Jake Ballard was great for the Giants in 2011 with 604 receiving yards and four touchdowns, but we’re concerned about his mobility and pain threshold, even 18 months after ACL and microfracture surgery. Ballard doesn’t have any guaranteed money on his contract, either, so the Patriots could cut him with no salary-cap penalty. 3. The Patriots could have an intriguing backfield with four different types of bodies. Stevan Ridley (5-11, 220) is the traditional every-down back, Shane Vereen (5-10, 205) is the pass catcher, LeGarrette Blount (6-0, 250) is a short-yardage tank, and Leon Washington (5-8, 192) is the speedy scatback and kick returner. Brandon Bolden appears to be the odd man out, and missing practice last week didn’t help. Rookie George Winn, who led the Big East with 1,334 rushing yards last year, can be stashed on the practice squad. 4. This is my seventh NFL training camp (spent the first six in Miami) and have never spent less time watching the offensive line. There is little drama or intrigue with this group. The Patriots return four of five starters from one of the best units in football — Nate Solder, Logan Mankins, Ryan Wendell, and Sebastian Vollmer — and the only real camp battles are for one or two backup spots, and whether Marcus Cannon can overtake Dan Connolly at right guard (both are currently not practicing because of injuries, although Cannon had been running ahead of Connolly during the first few days). All that matters for this unit is keeping it healthy and fresh until Week 1. 5. The Patriots will, of course, play multiple fronts on defense, but we like the way the front seven could look in a 3-4, especially because the depth at tackle isn’t great. The line would be stout, with Vince Wilfork on the nose and a buffed-up Chandler Jones and newcomer Tommy Kelly at end. The linebacker corps would then include Brandon Spikes, Jerod Mayo, and Dont’a Hightower, and a rotation of Rob Ninkovich, Jamie Collins, Marcus Benard, and Jake Bequette at the Jack position. Collins, who arrived at Southern Miss as a safety, also projects to be the coverage linebacker in nickel and dime situations. Fourth-year disappointment Jermaine Cunningham is battling with Jason Vega, Michael Buchanan, and others for a final roster spot. 6. The defensive backfield seems solid with Aqib Talib, Alfonzo Dennard, and Kyle Arrington at the top three cornerback spots, and a safety rotation of Adrian Wilson (first and second down), Devin McCourty, Steve Gregory (third down), and Duron Harmon. The team wants Ras-I Dowling to lock down the fourth cornerback spot — he was named one of 10 offseason MVPs — but the former second-round pick is once again nicked up and not practicing. Cornerback Marquice Cole appears to be outside looking in, but he may earn a reprieve if Dennard is suspended early in the season for his offseason arrest. One player who likely will make the team but has been disappointing so far is Tavon Wilson, last year’s second-round pick. He has been mostly invisible during camp and is playing with the twos and threes. Had the pleasure of catching up with Doug Flutie, who recently moved back to his childhood hometown of Melbourne, Fla., and is helping promote the release of EA Sports’ NCAA Football 14. Flutie is one of 1,400 college greats included in this year’s game, including Herschel Walker, Bo Jackson, and Barry Sanders. So you play as yourself and throw the Hail Mary 70 times a game, right? How do you think Bill Belichick will use Tim Tebow this year? “I really don’t know exactly how he’s going to use him. I think if anyone can, it’s Bill. Everybody’s like, ‘Oh, they’re going to turn him into a tight end.’ Well, tight end isn’t just running routes and catching the ball. That, I think he can do — he’s a competitor, he’s a tough kid, he’ll do anything that’s asked of him. “But you don’t just learn to play the position at the NFL level. There’s blocking schemes, there’s coming off the ball, there’s timing with the tackle as far as coming off of double teams, the physical nature of the position he’s never done. Do you think the Patriots can overcome everything that happened this offseason? If you thought to yourself last week, “Boy, there are a lot of former Florida Gators getting in trouble this offseason,” you weren’t alone. The stars from the Gators’ 2008 BCS title team have dominated the news cycle this summer, and for all the wrong reasons. Aaron Hernandez is embroiled in the murder trial of the year. Mike and Maurkice Pouncey had to apologize (well, one of them, anyway) for wearing “Free Hernandez” hats at a party. Giants safety Will Hill got a four-game drug suspension, the fourth member of that team to be suspended for drugs in the NFL (including Patriots Brandon Spikes and Jermaine Cunningham). Percy Harvin’s recent hip surgery, which could knock him out for the season, seems tame compared to his teammates’ exploits. Now receiver Riley Cooper is on leave from the Eagles for sensitivity counseling after he was caught on video angrily using the N-word at a concert this summer. The Eagles are standing by Cooper for now, but players in the locker room are rightfully upset, and this situation could turn toxic before too long. Cooper may have to take an extended break from football and the public spotlight if he ever wants to play again. One common thread among Hernandez and Cooper — Gators coach Urban Meyer used Tim Tebow to keep both of them in line. Meyer knew Hernandez was troubled when he arrived at Florida at age 17, and Hernandez and Tebow hung out a lot off the field during Hernandez’s freshman year. And Meyer roomed Tebow with Cooper for their senior season with the hopes of calming down Cooper, who had temper issues. Meyer’s former players can’t stay out of trouble now that they’re in the NFL and not under Meyer’s watch. Meyer takes heat for having 31 players arrested in his six seasons at Florida, but it’s amazing he didn’t have more. The Jaguars could be one of the NFL’s more fun teams this year, especially if they can get Blaine Gabbert figured out. The Jaguars have an owner in Shad Khan who doesn’t seem afraid to think unconventionally, and have an exciting new staff headlined by head coach Gus Bradley and offensive coordinator Jedd Fisch. Fisch began his coaching career at Florida under Steve Spurrier in 1999, and like the Head Ball Coach isn’t afraid to dig deep into his bag of tricks to move the football. Everyone knows they have rookie sensation Denard Robinson listed as an “OW,” or offensive weapon. Then at Friday’s practice, they pulled out the “Emory & Henry” formation — Spurrier’s creation — in which the offensive tackles are split wide, next to the receivers. The quarterback can throw a quick screen to a receiver, and have two giant blockers in front of him to pave the way. The Hall of Fame inducted seven new members Saturday night, but a few notable names were snubbed this year: defensive ends Charles Haley and Michael Strahan, receiver Andre Reed, guard Will Shields, cornerback Aeneas Williams, and owners Art Modell and Eddie DeBartolo. Next year could be a good time to clear out the waiting list, however, as the list of first-time inductees doesn’t have many big names. Of those newly eligible next year, only Tony Dungy, Marvin Harrison, and Derrick Brooks appear to be good bets for first-ballot induction. Zach Thomas, Warrick Dunn, Kevin Carter, Sam Madison, Shaun Alexander, Morten Andersen, and three former Patriots — Tedy Bruschi, Rodney Harrison, and Willie McGinest — will also be on the ballot for the first time. It took exactly two weeks of training camp for Dolphins fans to retreat into full-out panic mode. New $30 million receiver Mike Wallace is missing practices with a nagging groin injury, and new left tackle Jonathan Martin supposedly can’t block anyone. And injuries are starting to lay to waste some big plans elsewhere. The Eagles are now down two receivers in Riley Cooper and Jeremy Maclin (ACL), while the Seahawks lost their spark plug in Percy Harvin. The Broncos lost starting center Dan Koppen, and the Ravens lost Joe Flacco’s best friend and security blanket in tight end Dennis Pitta. Commissioner Roger Goodell said on ESPN Radio that he is “proud the Patriots took decisive action” against Aaron Hernandez, and had an interesting quote about the need to perform more diligence on player backgrounds. “It’s something that all clubs are going to have to reevaluate how they evaluate players . 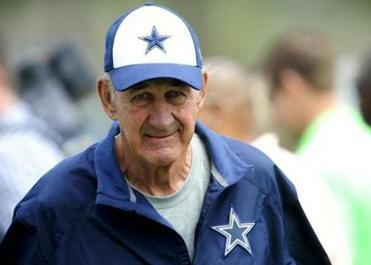 . . to make sure they’re bringing in the kind of people to represent the teams and the NFL in a positive way,” he said.